A thickly growing and abundant ground cover. Speedwell plant, Veronica officinalis, is well known to the ancient Celts as a treatment for battle wounds. Domestically used as a substitute for tea and as a remedy for the symptoms of stress and skin rashes. Speedwell plant is a native of Europe and is adaptable to most soils but prefers an open sunny position. Frost resistant but drought tender. A perennial ground cover, growing to 0.5m x 1m. 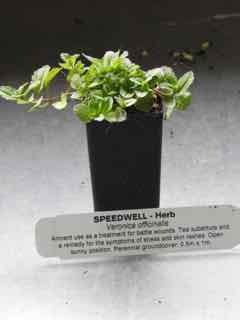 Be the first to review “Speedwell, plant” Click here to cancel reply.